Why Do We Wait in Doctor’s Offices? I’m writing this from the airport awaiting a flight to New York for a business meeting. My flight is delayed 90 minutes, but that’s ok, because before I even left for the airport I received two texts from Delta updating me on its status so I could time my departure accordingly. Compare that to the friend I wrote about in yesterday’s blog. She waited more than two hours to see the doctor . Another friend spent an hour past her gyn appointment time in the waiting room, then another hour naked, in the cold examining room with only a paper gown for warmth, waiting to be seen. If I took a poll of my readers, I guarantee 100 percent can share a similar experience. I, for one, have walked out after an hour. I now have a policy of walking out after 30 minutes unless the appointment is for an emergent issue or the office kindly slotted me in. 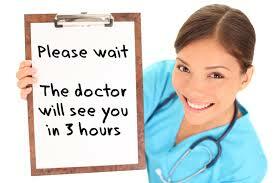 Yes, I know that doctors get behind schedule. I know emergencies happen. What I don’t understand is why, in today’s world of instantaneous communication , the office can’t send a text updating us on timing so we don’t waste our time sitting there. Plus, if you’re running late for nearly every appointment, there’s obviously something wrong with your scheduling system. A report by healthcare consultants Press-Ganey notes that after 10 minutes spent waiting, patient satisfaction drops by 7 percent. Not only that, but the patient’s overall impression of the practice, including the doctor, suffers. The Press-Ganey report suggests that once a patient has been waiting for 15 minutes, the receptionist walk into the waiting room, apologize, and explain what’s going on. I don’t know about you, but no one has ever done that for me. Instead, I have to go knock on the glass window and ask what’s going on, only to be chastised like a child because I’m not waiting patiently (ie, behaving). Given that doctor are increasingly being “reviewed” on sites ranging from Healthgrades to Yelp, as well as through formal survey instruments from Medicare, it’s time to jettison this outdated assumption that their time is worth more than our time and that we will sit in the waiting room until we grow cobwebs in order to see them. As our healthcare system shifts to become patient-centered rather than provider-centered, I can only hope that more doctor offices (and other provider settings) will ask themselves not what’s most convenient for them, but what’s most convenient for their customer — which would be us.